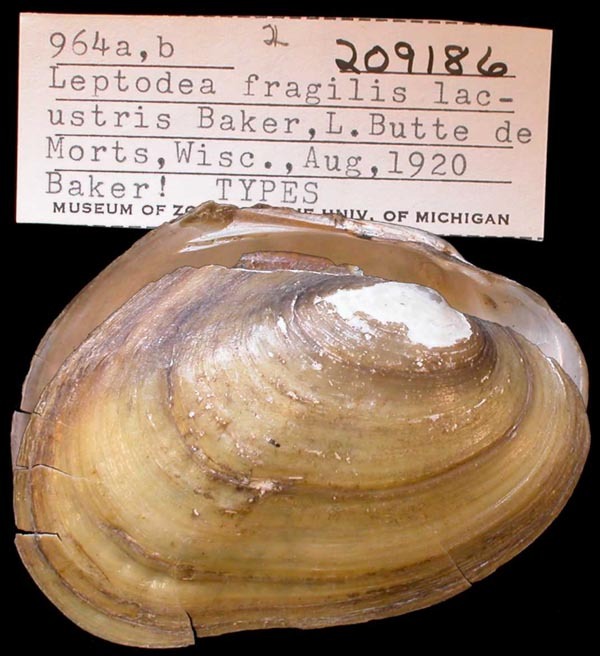 = Leptodea fragilis (Rafinesque, 1820). — Williams et al. (2017). = Leptodea fragilis (Rafinesque, 1820). — IUCN (2017). = Leptodea fragilis. — Pfeiffer et al. (2016). = Leptodea fragilis. — Jones (2015). = Leptodea fragilis. — Sousa et al. (2014). + Medionidus mcglameriae van der Schalie, 1939. — ITIS (2012). = Leptodea fragilis (Rafinesque, 1820). — McMurray et al. (2012). = Leptodea fragilis (Rafinesque, 1820). — ITIS (2012). = Leptodea fragilis. — Haag (2012). = Leptodea fragilis. — Boyer et al. (2011). 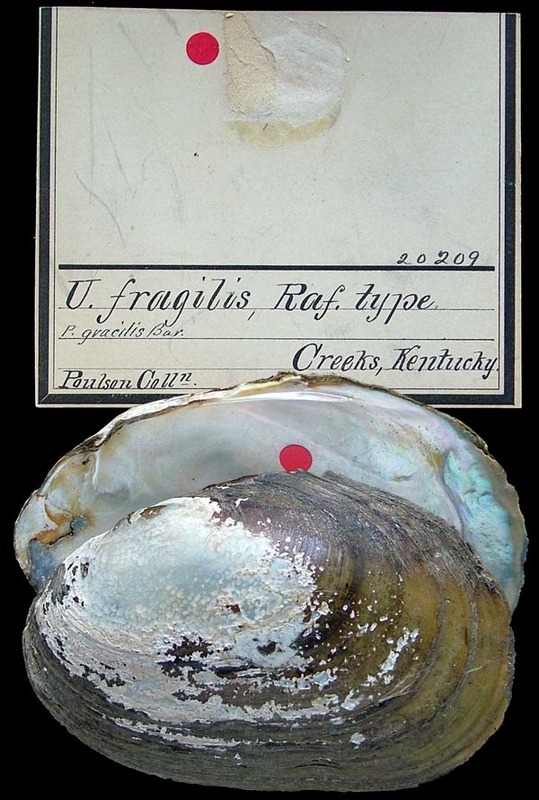 Unio (Leptodea) fragilis Rafinesque, 1820. Rafinesque, 1818, Amer. Mon. Mag. : 355 [‘Potamilus fragilis’] [nomen nudum]. Rafinesque, 1820, Ann. Gén. Sci. Phys. : 295. Rafinesque, 1864, [in] Binney & Tryon, reprint: 22, 41. Type(s): LECTOTYPE ANSP_20209, creeks, Kentucky. Unio (Leptodea) fragilis var. fuscata Rafinesque, 1820. Rafinesque, 1864, [in] Binney & Tryon, reprint: 41. Swainson, 1823, Zool. Illustr. : pl. 171. Conrad, 1836, Monogr. Fam. Unionidae: 55, pl. 30. Barnes, 1823, Amer. J. Sci. : 274. Barnes, 1823, Amer. J. Sci. : 272, text fig. 16. Unio (Niaa) atrata Swainson, 1823. Margarita (Unio) atratus Lea, 1836. ‘Swain.’ Lea, 1836, Synopsis Fam. Naiades: 31. Unio leptodea var. planus Jay, 1850. ‘Barnes’ Jay, 1850, Cat. Rec. Shells: 61. Ferriss, 1900, Nautilus: 38, text fig..
Lampsilis gracilis lacustris F.C. Baker, 1922. F.C. Baker, 1922, Nautilus: 131. F.C. Baker, 1928, Bull. Wisconsin Geol. Nat. Hist. Survey: 237, pl. 80, figs. 5-7; pl. 81, figs. 1-2. Type(s): HOLOTYPE (ORIG. DESIG.) UMMZ_209186, L. Butte de Morts, Wisc. Medionidus mcglameriae van der Schalie, 1939.
van der Schalie, 1939, Occ. Pap. Mus. Zool. Univ. Mich.: 1, pl. 1, figs. 1-3. 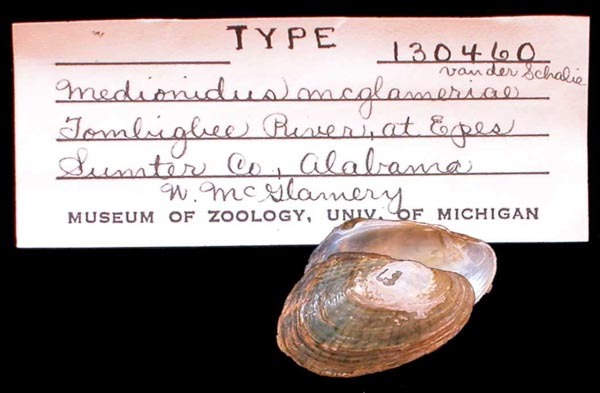 Type(s): HOLOTYPE UMMZ_130460, Tombigbee River, Epes, Sumpter Co., Alabama. Medionidus macglameriae Turgeon et al., 1988. ‘van der Schalie’ Of Authors. Unio plantus Williams et al., 2008. ‘Barnes’ Williams et al., 2008, Freshw. Mussels AL and Mobile Basin: 419.